This is an accessible guide to critical literacy, a process in which learners are encouraged to challenge and critique language and social practices and actively transform what they see as unjust or unfair. Crucial critical literacy concepts such as access, power, reconstruction and transformation are explored in respect of both the wider literature and as they relate to the experiences and practices of those educators who feature in the book. The key practice areas for developing children's criticality are also covered, including the use of toys, children's literature, comic books and graphic novels, photographs and new technologies. Threaded throughout the book are the intersecting social justice issues of gender, race, disability, displacement and social class. Material is drawn primarily from educators' own narratives about transformative change in their practice - including their struggles to understand and enact critical literacy - alongside examples of their pedagogies for social change. 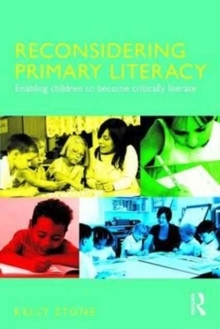 The author identifies a number of clear directions for educators interested in using a critical pedagogical approach in their work with children and young people - helping them to understand what critical literacy is; how they can weave it into their own practices; with which ages, stages and grades critical literacy can be used; and how they can get started using critical literacy in their classrooms.